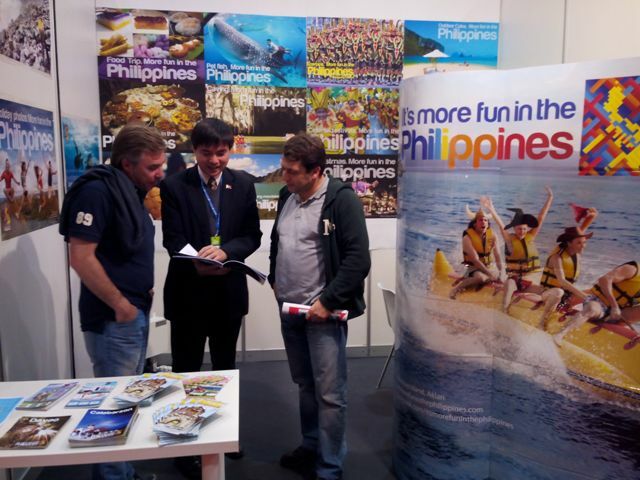 12 March 2014 – The Philippine booth received a lot of attention in Portugal´s biggest tourism fair, Bolsa de Turismo de Lisboa, which was held from 12 to 16 March 2014 at the Feira Industrial de Lisboa located in Parque das Naçoes in Lisbon. The annual tourism fair, now on its 26th year, was participated in by Portugal´s national and regional tourism boards, airline companies, hotels and resorts, tour operators, travel agencies and other members of the tourism industry. As in the previous years, a number of foreign embassies participated in the tourism event and put up their respective booths. “We are elated to receive a lot of people interested in visiting the Philippines. Our main goal here is to remind the Portuguese the historical relevance of our country to their history and for them to experience how it is more fun to be in the Philippines,” said Philippine Ambassador to Portugal Philippe Jones Lhuillier.